Native planting and seeding into prescribed burn area at Sampson Creek Preserve for monarch butterfly habitat restoration November 2017. Planting and seeding in the prescribed burn area in upland grassland and oak savanna habitat at the Sampson Creek Preserve. 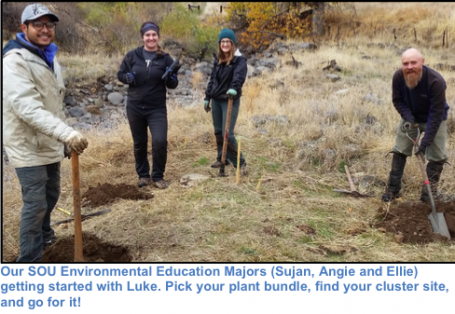 In November Klamath-Siskiyou Native Seeds (KSNS) took part in a major native planting project for monarch butterfly habitat on the Sampson Creek Preserve outside Ashland, OR, near Emigrant Lake. The Sampson Creek Preserve is managed by the Selberg Institute as a nature preserve that encompasses nearly 4,800 acres of undeveloped grasslands, woodlands and forest. 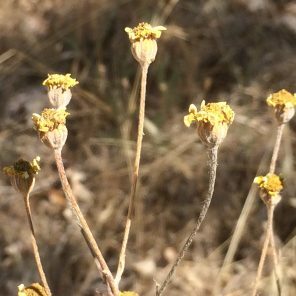 The preserve was a former cattle ranch and long-term cattle grazing has had an impact on the herbaceous native plant community in what is otherwise a stunningly beautiful and highly valuable habitat that borders the Cascade-Siskiyou National Monument. 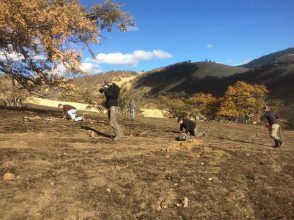 The Selberg Institute is taking steps to combat invasive species and restore the native plant diversity on the preserve. SOU Environmental Education Majors helped out with the monarch habitat planting along Sampson Creek. Planting native plants for monarch butterfly habitat in the riparian area at the Sampson Creek Preserve. The Sampson Creek Preserve planting is part of a larger project partially funded by a $193,786 grant from the National Fish and Wildlife Foundation’s Monarch Butterfly Conservation Fund. 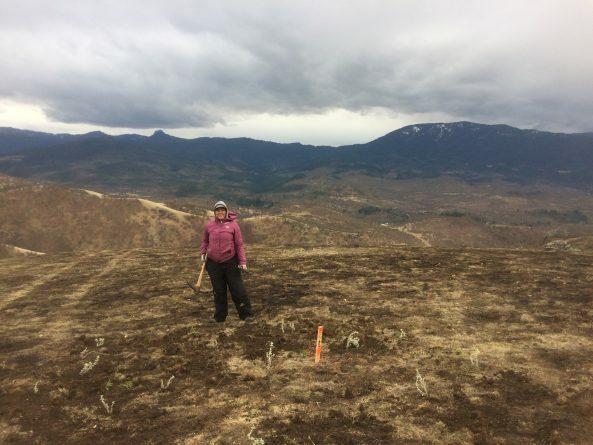 A coalition that included the Selberg Institute, Southern Oregon Monarch Advocates, US Fish and Wildlife Service, Forest Service, BLM, and Lomakatsi Restoration Project secured the grant in order to do restoration work on a wide variety of sites in southwest Oregon, and across a large geographic area. Sites include Forest Service land in Agness, BLM/TNC land on Table Rocks, Forest Service land in Butte Falls, private land in the Colstein Valley and Ashland areas, as well as the Sampson Creek Preserve. 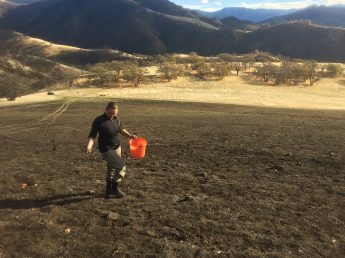 This landscape-scale project is likely the largest effort to restore western monarch butterfly habitat in the West. Planting native milkweed and other native herbaceous plants into the prescribed burn area at the Sampson Creek Preserve. 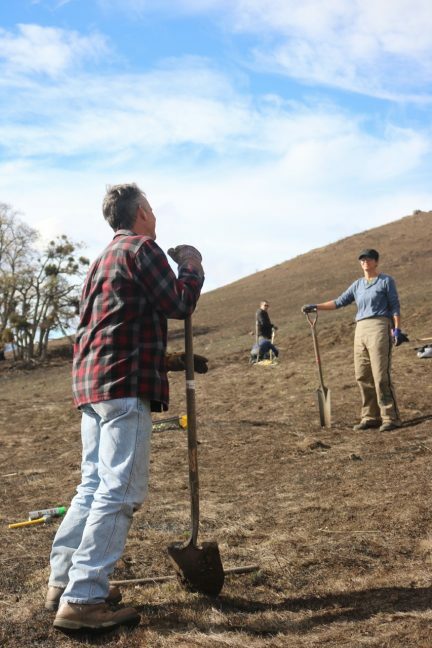 The overall goal of the project is to restore monarch butterfly habitat on 300 acres in southwest Oregon. The Sampson Creek Preserve portion of the project includes 40 acres of restoration within riparian habitat as well as upland, grassland habitat with an oak savanna component. 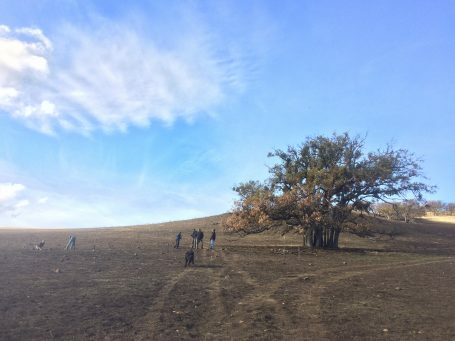 Twenty acres of the grassland and oak savanna had a prescribed burn in the fall prior to planting and seeding. 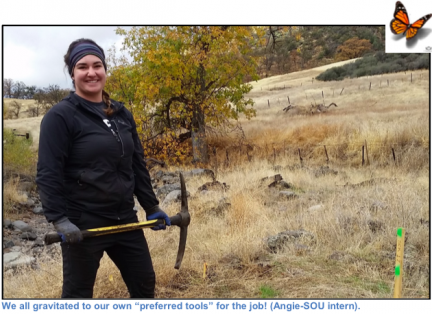 With help from KSNS, Southern Oregon Monarch Advocates (SOMA) and the Selberg Institute designed and implemented the planting and seeding at the Sampson Creek Preserve. The planting at the Sampson Creek Preserve included a wide-variety of community partners, organizations, and volunteers: Pollinator Project Rogue Valley, Southern Oregon University students, SOMA, BLM botany interns, KSNS, the Selberg Institute, local monarch and pollinator advocates, and retired BLM and Forest Service staff, all pulled together to make it happen! Seeding into prescribed burn area at Sampson Creek Preserve for monarch butterfly habitat restoration November 2017. 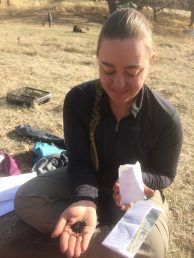 Maia Black, Executive Director of the Selberg Institute, mixing and planting seeds collected by Klamath-Siskiyou Native Seeds in the prescribed burn area. 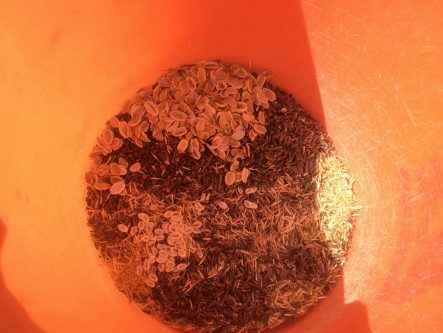 Custom, site-specific seed mixing of native seeds collected at the Sampson Creek Preserve for seeding into the prescribed burn area. 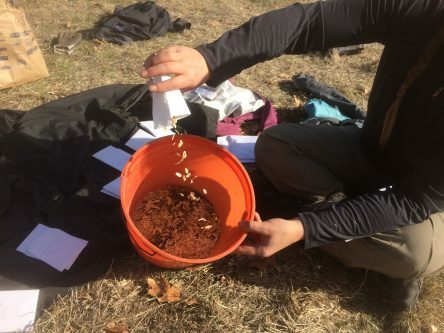 We took care to collect ethical amounts of seed from various collection locations on the Preserve to ensure the long-term viability of existing native plant populations. 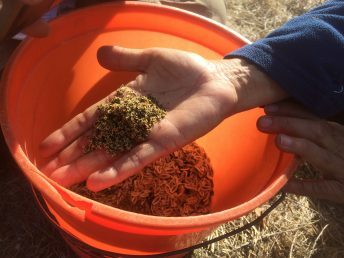 We collected, dried, and cleaned the seed, returning the seed to the Selberg Institute for the current monarch butterfly restoration work, and future restoration needs. 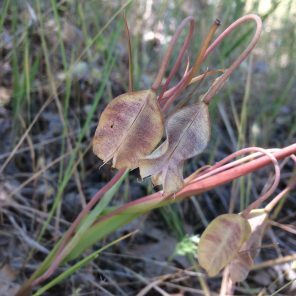 It is important for local, genetically appropriate, site-specific native plant seed to be used for habitat restoration to ensure genetic diversity and local adaptation. 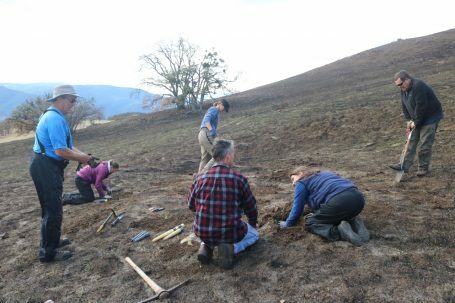 We commend the Selberg Institute for their commitment to using local native plant seeds for their projects. 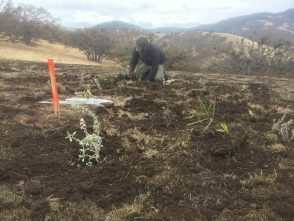 Over 7,000 native plants were planted for monarch butterfly habitat at the Sampson Creek Preserve, with a good portion of the seed used for the nursery-grown plants collected on-site at the preserve by Klamath-Siskiyou Native Seeds. The majority of the plants were milkweed for monarch caterpillars, but there was also a large, diverse selection of native nectar plants for adult monarchs planted as well. This work will benefit monarchs, but it will also benefit many other species of pollinator and wildlife at the preserve. Oregon sunshine (Eriophyllum lanatum), Tolmie’s cat’s ear (Calochortus tolmiei), Harvest brodiaea (Brodiaea elegans) seed collected at the Sampson Creek Preserve by Klamath-Siskiyou Native Seeds. 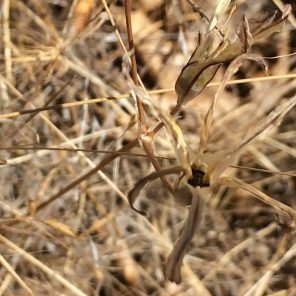 If you are interested in contracting Klamath-Siskiyou Native Seeds seed collection services for a project, please contact us early, as our summer seed collection season fills up fast!